Samaria Regional Council head Yossi Dagan intervenes when Arabs carry out illegal construction on land owned by Jewish town. Residents of the town of Avnei Hefetz in Samaria noticed Arabs carrying out construction work on land owned by the town. 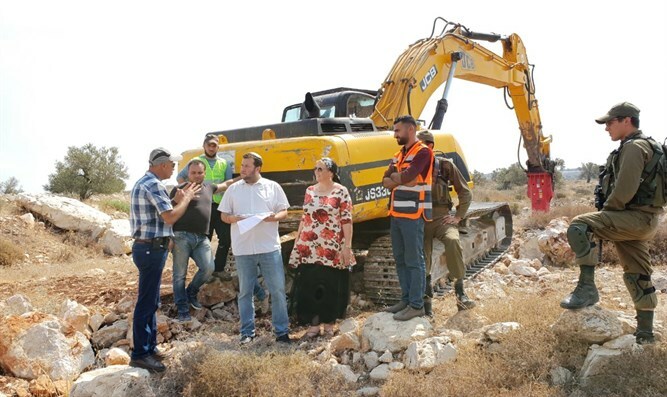 The head of the Samaria Regional Council, Yossi Dagan, who arrived at the site with town chairman Shuli Langerman, called on the Civil Administration and police officers to stop the work immediately. It soon became clear that the works were meant to connect the Arab village next to a water pipe.The Arabs claimed that the Civil Administration had approved the work, but the council found that this was not the case. "We will not allow construction and invasion of the area without the coordination and approval of both the settlement and the council," Dagan said. "We expect the Civil Administration's legal authorities to respect our authority and our full responsibility for the area, certainly no less than they would have done had it been the opposite case, in which Jews would want to transfer infrastructure in the area of an Arab village." "If the Arabs in the nearby village need water, we will be happy to help, but only with orderly coordination according to the law, with an emphasis on preserving existing infrastructures, and with an obligation to transfer the pipeline if the community sees fit to build there," he said. Avnei Hefetz chairman Shuli Langerman said that "a settler who went to the field on a tractorwithout proper permits would be arrested and his equipment confiscated in large headlines in the press. A Palestinian who goes to an area that does not belong to him receives full backing for work without permits, while trampling on the rights of others and causing irreversible future damage. "